The Indian Rocks Christian Open opened up on a sweltering summer evening. The JV races went off first giving Varsity some extra minutes to prepare. 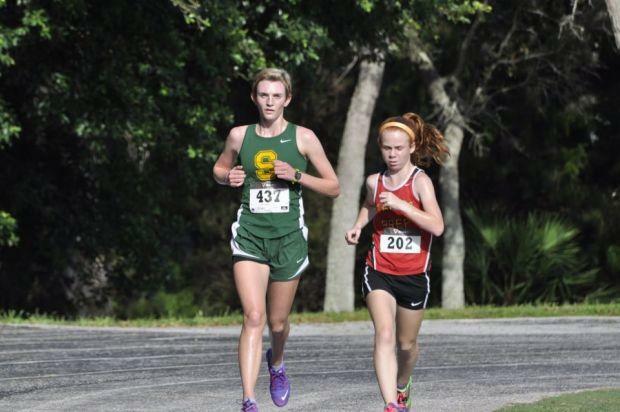 As the girls race set off, Shorecrest's Olivia Rovin and Tampa Prep freshman Josie Garba began to out-pace the field. The course at IRC took three laps around around various landmarks. The starting chute went through the football field and the first loop wrapped around the baseball field, came down through the parking lot and made a loop around the school before emerging onto the track with a sharp turn to the left onto the track, before starting into the second loop; each was roughly one mile. Rovin and Garba were stride-for-stride through the first mile with a pack of Berkeley Prep girls holding down the third, fourth, fifth and sixth spots. "She (Rovin) made the move early and my plan was just to stick with her," Garba said. "I had to pace it out or I was going to die from the heat." Around for the second loop, Rovin and Garba began to put seconds on the Berkeley pack. Into the third loop, Garba made her move. "I started to wonder if I was going to be able to pass her (Rovin) or not," Garba said. "But then I felt her wear down and then just past the baseball field I made my move and just tried to put space between us - I don't have a big kick so I wanted to make my move early enough." The longer-legged Rovin could have run down Garba in a finish line kick but Garba made sure it didn't come to that as she raced across the finish in 19:43.30. Rovin, recently declared cancer-free from a battle with Hodgkin's Lymphoma, finished with a strong 19:53.90. "The race felt good aside from the heat," Rovin said. "My arms started to seize up with three-quarters of a mile to go but I kept pushing through it." 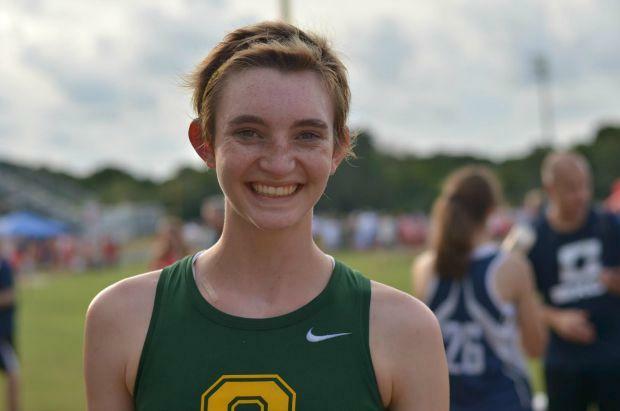 Rovin was thrilled to knock 50 seconds off her time from last Saturday's Jim Ryun Meet in Lakeland and claims she's, "110 percent, feeling better than ever". In the boys race, Shorecrest's Luke Peterson flew out to an early lead pulling the pack along with him. Around the baseball field the first time it was Peterson building a lead on Berkeley Prep's Leo Ochoa with Carrollwood Day School's Jack Pironti in third, a few seconds back. "By the second loop, I just wanted to stay with him (Peterson)," Ochoa said. "He went out so fast but I felt confident." 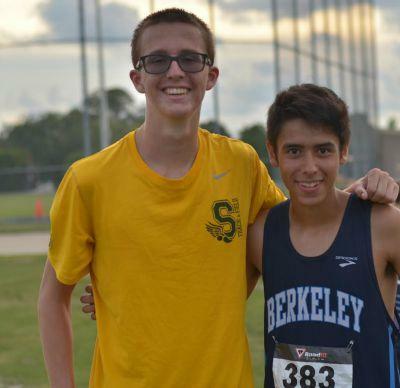 When the runners emerged at the two-mile mark, Peterson had a good, five-second lead on Ochoa and Pironti was being challenged by IRC's Justin Nunamaker, roughly 15 seconds behind Ochoa. That's when Ochoa decided to challenge a much taller Peterson. "Into that third loop, I started to close and I thought I had a chance," Ochoa said. "Once I got to him (Peterson) I made a definitive move and just started to kick out from the point where I passed him." Rememeber that sharp turn coming onto the track? Ochoa remembers as he ate it, just yards from the finish line. 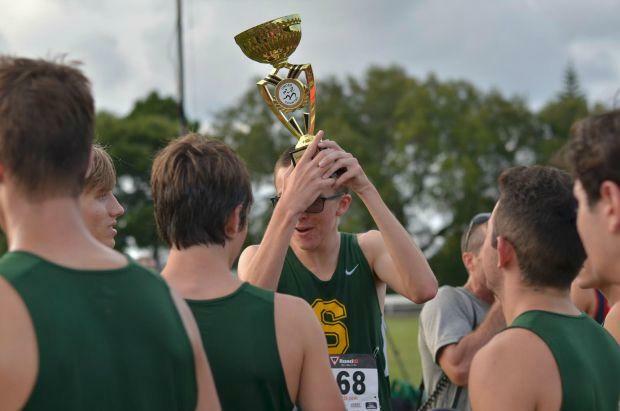 Yet Ochoa, skinned knees and all, got up and kicked it out taking first with a time of 16:10.30, a time that moves into the third best run in Florida in the early goings of the season. Peterson came in second with a 16:19.10, a time that takes over the fifth-best time in the state so far. Pironti fought off a stout challenge from Nunamaker to take third in 16:53.1 and Nunamaker finished in 16:57.20. Peterson and the Chargers roared to a team victory with 47 points to runner up IRC with 114, CCC boys took third with 132. Justin Scoby took seventh for the Chargers and Casey Cureton grabbed 10th. All five Charger boys finished in the top 18. The meet grew in 2015. IRC coach Bobbi Labrant said that with the same number of schools as last year's meet, there were 100 more runners on Thursday. The Berkeley girls were dominant, taking the third, fourth, fifth and seventh spots with number five runner Katie Freedy finishing in 10th. The Bucs number six, seven and eight runners also placed in the top 17. 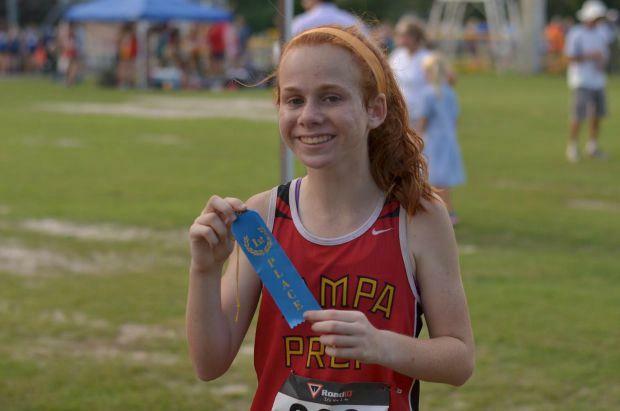 Caroline Brown led the way for the Bucs with a 21:20.3 and Christiana Till was not too far behind her at 21:41.50. Abby Walters grabbed fifth in 21:58.7 with IRC's Ava Labrant breaking up the Berkeley string with a 22:02.80 for sixth. Thus, the Bucs finished with a razor thin 24 points, more than doubling up Shorecrest with 57. Host IRC girls were third with 89.